Women's Wellness, Holistic Healing, Spiritual Psychology, & Plant Medicine. Office In Sheboygan, Wisconsin. Appointments, Consultation, Classes, Certifications, & Retreats Serving the Midwest. Online Services & Classes! Spiritual Psychology for Holistic Healers -Coming Soon! The Chakras are an ideal roadmap for personal growth and development. In 2017 we started our journey through the Chakras and focused on one energy center a month. We are going to keep on going in 2018! On our monthly adventure, I am going to educate you about a Chakra and then ask you to contemplate its function and roll in your own personal growth. April brings us to the Hand Chakras, minor Chakras on the palm of each hand. These Chakras influence healing and transmutation. Healing energies from the universe (such as Reiki) are channeled through these chakras. Energy flows from the universe to the crown chakra, to the third eye, to the throat, to the higher heart, to the heart, then down the arms and out the palm of the hands. So the energy of the Hand Chakras is literally heart energy; full of compassion, light, and love. We can pass this love energy to ourselves or on to others. Massage therapists, Energy Healers, Chiropractors, Nurses, and others with a healing touch are guided by the Hand Chakras. The Hand Chakras can assist in transforming dense energy into higher vibrating energy. This month, the Hand Chakras ask you, metaphorically, – can you change lead into gold? Brief Overview of the Chakras: Our subtle energy bodies are made up of numerous energy channels that all together form a matrix. These channels flow through and around the body like highways of energy. These flows of energy are known as nadis in the Vedic tradition and meridians in the Chinese Medicine tradition. Where these flows of energy crisscross and intersect is where the chakras are formed. The Chakras are energy centers and vortexes in our subtle body. Seven large energy channels crisscross to form the major chakras (Root to Crown). These large energy channels are the flow of manifestation, liberation, expression, reception, ida, pingala, and sushumna. Minor chakras form where the lesser nadis cross. As there are many nadis, so there are many minor chakras. The Chakras are openings for life energy to flow into and out of our aura or electromagnetic field. There are main Chakras, minor, subpersonal, and transpersonal Chakras. The Chakras’ function is to vitalize the physical body and to bring about the development of our self-consciousness. Each Chakra is associated with certain physical, mental, emotional, and spiritual interactions. Each Chakra has personal growth themes, functions, and purposes. The concept of the Chakras has been around for thousands of years; but the energy coming to us from the cosmos is changing. We are receiving potent and new energies of high frequency light from the universe. The main Chakras (Root to Crown) were appropriate for us these past 2000 years. As we move into a new era, chakras above, inside, and below the physical body are forming and others are waking up from dormancy to help us evolve into our new future. Our journey through the Chakras will focus on ALL of these Chakras; main, minor, subpersonal, and transpersonal. The Hand Chakras are minor Chakras located on the palm of each hand. Though there is an energy center on each hand, technically together they make up one chakra. These energy centers are usually seen as some shade of pink. Please do not assume that a minor Chakra is not as important as a major Chakra; all the energy centers work together to keep us whole, complete, and balanced. The Hand Chakras work in conjunction with the Heart and Higher Heart Chakras and influence healing and transmutation. Healing energies from the universe (such as Reiki) are channeled through these chakras. Energy flows from the universe/source down to the crown chakra, to the third eye, to the throat, to the higher heart, to the heart, then down the arms and out the palms of the hands. So the energy of the Hand Chakras is literally heart energy; full of compassion, gratitude, harmony, peace, light, and love. We can pass this love energy to ourselves or on to others. By strengthening the Hand Chakras, we are also increasing their connection with the Heart Chakra and thereby increasing our capacity to give love and receive love. Heart energy is the highest vibrating energy; therefore, energy from the Hand Chakras can be used to transmute negative, dense, low vibrating energy into more useful, higher vibrating energy. April 2018 Hand Chakra Contemplation and Suggestions: Contemplate and assess sources of negativity and low vibrating energy in your life. Are they people, places, situations, or things? Or are they limiting beliefs and thoughts you have about yourself? Is it time to let go? Are you ready to release what holds you down, blocks your path, and keeps you stuck? Transmutation refers to the change of one substance into another. In alchemy, Magnum opus is the process of personal and spiritual transformation by taking the junk and chaos in your life and using it as the catalyst for enlightenment. Are you ready to change this lead into gold? Sit with your hands in prayer position in front of you. Visualize roots growing out of your feet and going down into the earth below you and grounding and earthing your entire body. When you are ready, visualize white light entering the crown of your head and filling the whole of your body from top to toe. See it entering each one of your chakras in turn, filling, cleansing, balancing and harmonizing each one. Watch as the energy flows from your crown chakra, to the third eye, to the throat, to the higher heart, to the heart, then down the arms and out the palms of the hands. 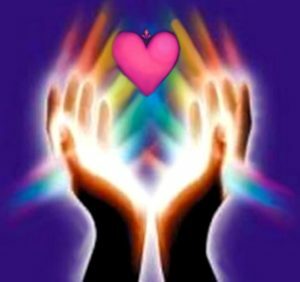 Visualize high vibrating heart energy flowing out of the palms of your hands and filling the whole world! If you have identified a source of negativity in your life, visualize the energy from your Hand chakras flowing to this negativity and slowly starting to raise its vibration. Bless this source of negativity in your life and then release it and set it free. Sit for as long as you like, before drawing your ‘roots’ up from the earth and bringing yourself back into the present. Past Life Regression in WI!Past Life Regression in WI!